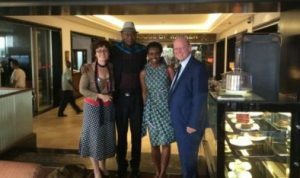 Kampala (Uganda) – March 21, 2017 (travelindex.com) – During his various interactions did St. Ange come across as a credible candidate from Africa, embracing diversity and a non discriminatory approach to making his vision of ‘Tourism For All’ a reality. St. Ange has now gathered a wave of endorsements from around the world with growing private sector support but also from important associations like GIHP (Groupement pour l’insertion des personnes Handicapees Physiques) of France. He then went on to speak about the electoral procedure when he added: ‘I appreciate that it is the Minister of Tourism of the countries with a seat on the Executive Council of the UNWTO who will be casting a vote in the May elections, but believing in Democracy it is important to let those who have worked with me for tourism to also echo their feelings as they speak to their own Governments about their ideal choice. I am thankful for this democratic approach of endorsements for the coming election for the seat of Secretary General for the UNWTO by the frontline team of tourism. They have worked with me for tourism and they know me well. They all remain the motor behind tourism and what makes tourism tick’. St. Ange then concluded his interview by adding: ‘If elected as Secretary General I will raise the cause of tourism for all as a must for a UN body. My strategies to help not only the disabled traveller, but also to help the person with a disability find work in the tourism industry are clear. We all know that travel produces long term health benefits with leisure opportunities relieving stress. We also know finding employment for people with disabilities is a must as we grow up and respect people…simple. My vision also includes the setting up of regional UNWTO offices to directly benefit member states and allow an immediate response should any type of event make this necessary. Imagine how the wider East Africa could benefit from such a presence in terms of support’. Following his visit to Uganda will St. Ange continue his whirl wind tour to drum up further support for his candidacy, which just three days ago received a massive boost when he made an appearance on both Adam Boulton’s ‘All Out Politics’ programme on Sky News before then having the chance to address the CNN global audience when being interviewed by Richard Quest.